Top adjustable range : 42.75" ~ 65.25". Bottom adjustable range : 57" ~ 74.5". Fits most Pickup truck. ORDER FACTORY DIRECT! FULL WARRANTY INCLUDED! USA MADE! Fitments: 2005-2018 Toyota Tacoma Double Cab Product Description Brand new complete roof cross bar system comes with everything you will need to fix to your vehicle. These bars will surely look great. Feature Condition: Brand new Material: Aluminum Style:Roof Rack Warrenty: 5 years Easy installation No Drilling Required Professional Installation is Highly Recommended Package Content: 2pcs of cross bar. TypeUniversal Roof Rack. Interchange Part NumberCar Top Luggage roof rack cross bars. Other Part NumberCar Top Luggage roof rack cross bars. 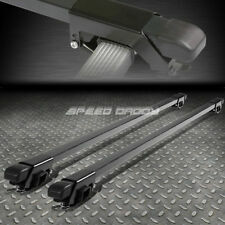 ★ 47" universal cross bar roof rack system. 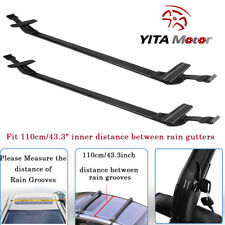 ★ Apply to any vehicles with car roof width less than 1220mm(48"). 2005 - 2010 Honda Odyssey (all models with factory installed roof rails). Passenger Side Front Roof Rail End Cap. 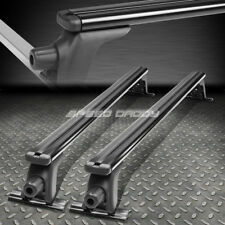 FIT FOR MOST VEHICLE WITH EXISTING ROOF SIDE RAILS. (DO NOT FIT MODELS WITH FLUSH MOUNTED STYLE ROOF RAILS). 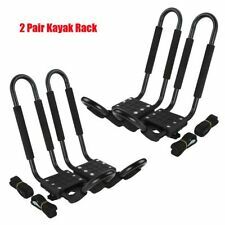 1 PAIR OF 55"/140CM ADJUSTABLE ROOF RACKS/CROSS BARS. Roof racks length : 55" / 140 cm. SPECDTUNING INSTALLATION VIDEO: UNIVERSAL PAIR OF ALUMINUM ROOF RACK BARS. This rack is heavy-duty, economical, light and can support up to 500 lbs. It permanently bolts to your truck bed for your carrying your wood, ladders and other construction materials and tools. Top Mounting rack adjustable width: 42.1" - 64"9 (Overall). 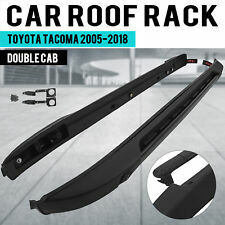 Fits all Toyota Tacoma double cab models 2005-2017. Low profile roof rack installs with ease on factory roof rail channels. No drilling required when mounting this rack. Both cross bars swing back into the rail and lock when not in use. Measure the distance of Rain Grooves Approx 43.3"
103H Surco Van Rear Door Ladder Non-Slip Tubular With Over-The-Door Hooks. ☑Fast Shipping from US! ☑Low Price for Great Quality! If so, you can have a try of our 2pcs 54" Steel Roof Top Rack. Easy to install when it is necessary. What do you hesitate for?. Just order! 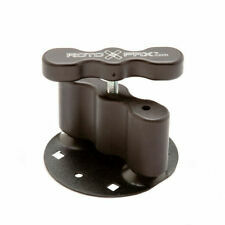 Can be used with other roof accessories such as bike rack, snowboard mountings,roof racks, etc. Genuine OEM Honda Pilot Driver Side Front Roof Rail End Cap 2003-2008. Passenger Side Rear Roof Rail End Cap. 2003 - 2007 Honda Pilot EX & EX-L. 2008 Honda Pilot (all models). 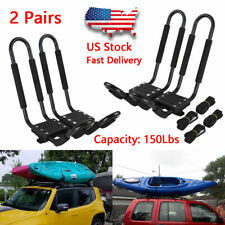 Universal Black Steel Cargo Carrier Roof Rack Basket Luggage Holder. 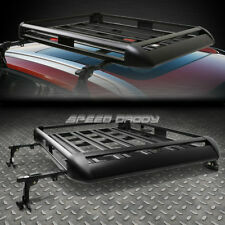 Carry big loads and mount accessories directly to the crossbars or straight bars of this roof rack cargo basket. Universal Roof Rack with Extension. Promotion!!! Enjoy 15% Discount This Week!!! Fits 17-19 Honda CRV OE Factory Style Roof Rack Cross Bar Aluminum Silver. Roof rack cross bars specially designed for Honda CRV, 2017 and up. Fit for Honda CRV 2017-2019. Honda roof rack side rails made of aluminum alloy, anti-corrosion. A roof rack is a set of bars secured to the roof of a motor car. 2005-2018 Toyota Tacoma double cab models only. 1 X Roof Rack. Mounting hardware,as our pic shown. 1 X Cross Bar Set. Made of high quality light weight durable aluminum. 1 PIECE OF ROOF RACK BASKET. Ideally assists to transport luggage, ladders, cargo, etc. securely from slide off. FIT FOR MOST VEHICLE WITH EXISTING ROOF SIDE RAILS. Full extension : 64" x 39" x 6½". BLACK TEXTURED FINISH HEAVY DUTY STEEL. Instant cargo space for vehicle with cross bars; Basket size - 46" x 36" x 4-1/2". Our MaxxHaul roof rack is constructed from durable rugged steel with weather resistant finish to resist corrosion. Instant cargo space for vehicle with cross bars. 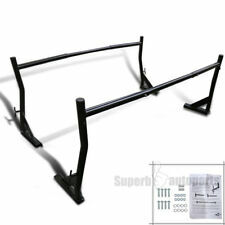 【2" Hitch Receiver】– Universal design fits all 2" hitch receiver. Features: 【Max 500LBS Loading Capacity】– Item holds up to 500 lbs. Durable steel support poles on basket& extra-thick folding receiver tube let you feel free to throw all extra camping gear in the basket. Maximum loading capacity of 500lbs. This item will work if your van has the rain gutters on the edges of the roof. This rain gutter is where this mount attaches to. Without the rain gutters the ladder rack cannot be mounted. High Qulity, Lowest Price! ship in 1 workday! Hook & loop tapes to protect roof bag against strong wind when drive at high speed. Great for extra storage space. Our goal is to make your choice easier and save your money. Keeper Waterproof Rooftop Cargo Bag. Rooftop cargo bag increases vehicle cargo space. Type: Roof Bag. Waterproof - Oxford Materials. Folds compact flex to fit odd-shaped loads, easy for storage. Color: Black. What You'll Receive x1 Pair of Roof Rack. Style OEM Factory Style. Color & Material Silver ABS Plastic Aluminum (Mounting Base). Built for the outdoor adventurers lifestyle. Easy to install with 4 universal U-bolts. A steel wind fairing is also included. Carry big loads and mount accessories directly to the crossbars or straight bars of this roof rack cargo basket. 2010-2019 NISSAN NV200 MODELS ONLY. 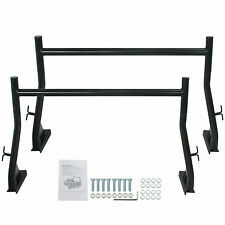 1 PAIR OF ADJUSTABLE ROOF RACKS/CROSS BARS. Ideally assists to transport luggage, ladders, cargo, etc. securely from slide off. (Not available for bull bar / side step bars / bumper step / tonneau cover / racing seats.). 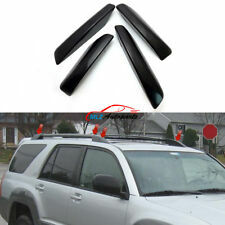 Universal car top roof rack cross bar. With rubber pads on bottom to prevent damaging car paint. Adjustable clamp design for desirable length. We will do our best to reduce the risk of duties. 90 Days Warranty! Premium quality! Fast delivery!